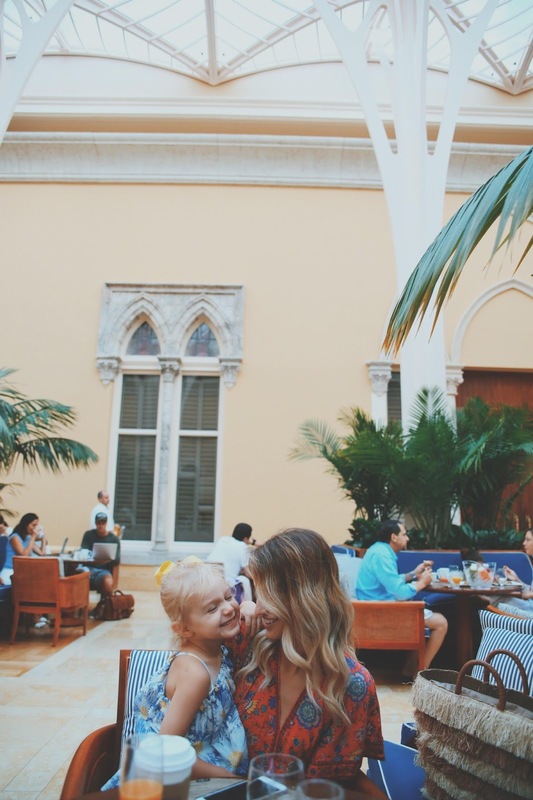 We had such an incredible weekend stay-cation at the Waldorf Astoria, Boca Raton Resort. Our first night, we got in a little late because Chris was not able to get off work. That didn't slow us down one bit. We arrived to a stunning lobby, and the entrance to the resort is just as beautiful with the palm tree lined drive up to the 'boca pink' resort. I mean come on, how many resorts can pull off pink like this? Not many, I'll go ahead and tell you that. Entering the lobby, you immediately feel comfortable and at-home. Chris did a little research and found some fun history about the resort. 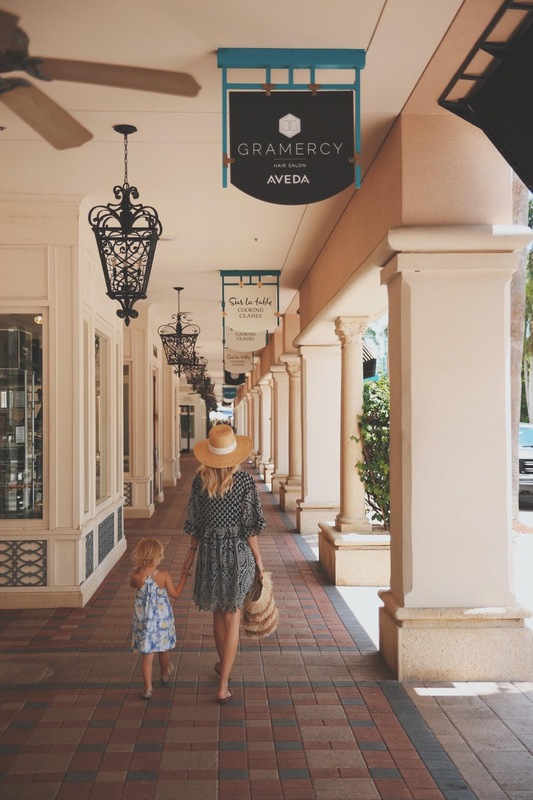 The architecture is breathtaking, and we have Addison Mizner to thank for that. The high standard of service dates back to the very beginning when the resort was originally The Cloister Inn. If you like sushi, try Morimoto. Serendipity is right across from Morimoto, and was such a fun experience for a sweet tooth craving. I had never actually tried the famous frozen hot chocolate. Madelyn can agree it didn't disappoint. I have family members that regularly enjoy the resort and my aunt loves the Monkey Bar. Since we had the kids, we decided not to interrupt any of the adults relaxing. 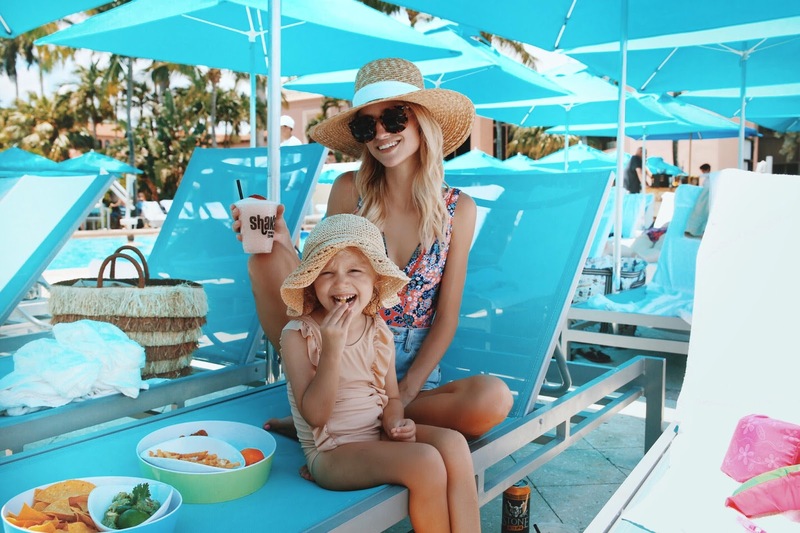 Although the entire resort is totally family friendly and makes everyone feel welcome. We just like to be extra respectful of other guests! Okay, there is so much to do here. The resort itself has a pool and surf simulator on property. There was live music every night we were there, and a lot of nightlife. You can view the full list of amenities and activities here. 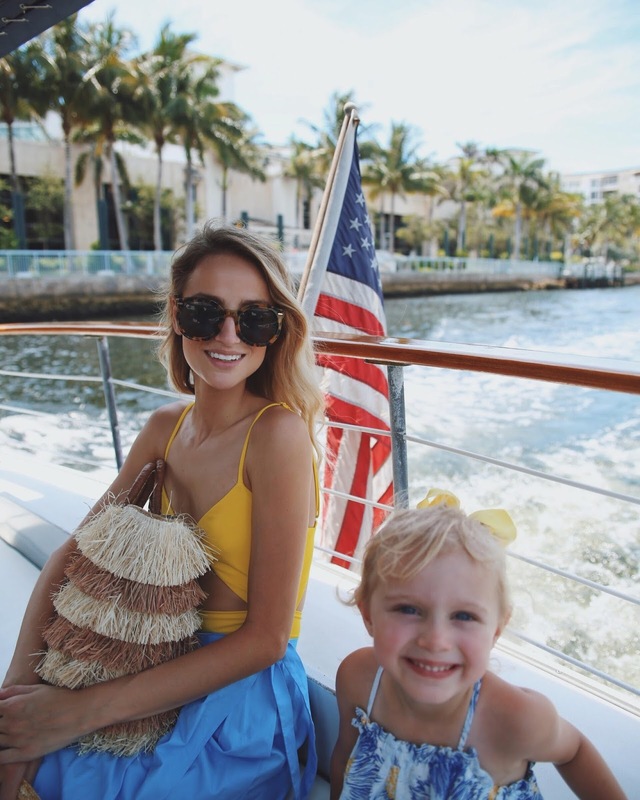 We took the water taxi over to the Beach Club, and spent our first full day poolside. If you really want that relaxation, rent a pool cabana. I thought it was one of the coolest experiences we have had to be able to play in the pool, relax on our private chairs, walk down to the beach, and then be able to come back into the cabana and cool off. There is a restroom and shower, TV, and furniture to relax and enjoy the food. The particular pool we were at was so perfect for families, because it was a walk-in design similar to the shore of the beach. We loved the guacamole, chicken fingers, fish tacos and ladies... the Froze' is a must. You can't taste the alcohol, and it's not too sweet. I thought I had died and gone to heaven. ha ha! Our last morning, we spent at the pool on property at the resort, which overlooks the intracoastal waterway with all of the beautiful yachts. You can experience the ritual bath, facials, massages, and plenty more to choose from. The spa has its very own relaxing pool area where you can also have lunch. A quick drive down the street and you'll arrive at Mizner Park. This is where we have gone for plenty of pictures in the past. There are a lot of great shops and restaurants. I love Kendra Scott, Sugarboo & Co, Janie & Jack, Lord & Taylor, and Elegant Child children's boutique is also right down the street. There are beautiful stores inside the Boca Resort incase you do not want to venture off grounds. 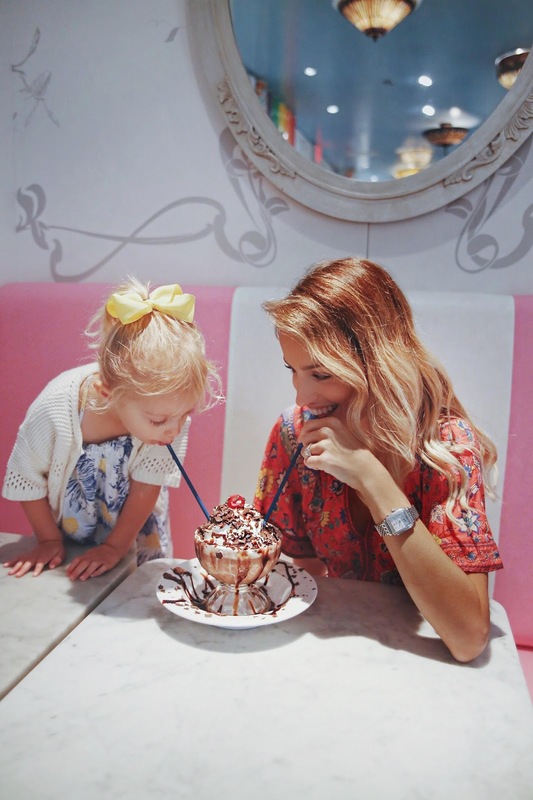 I popped into the cutest children's boutique, and found many stores for myself including Michelle Farmer. I hope I haven't overwhelmed you all with this post, we just had such an amazing time here that I felt I really needed to do a recap post. Especially because so many of you were writing me on Instagram for more info about our stay. This post is not sponsored, but our trip to the Boca Resort was. All thoughts and opinions are always my own and very honest. In the past, I have mentioned a terrible experience at a hotel in New York, so please trust that I am always real with you! Thank you so much for reading and following along. I hope you all have a fun and safe holiday! !